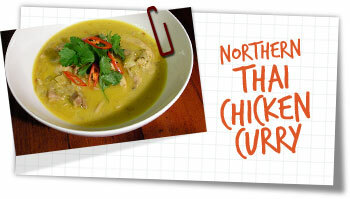 This has a distinctive flavour of Northern Thailand. There’s a heavy use of ginger which is a characteristic of the region – not unlike the cuisine of Thailand’s neighbour, and one of my favourites Myanmar (Burma). The use of turmeric gives a stunning orange appearance. What isn’t so stunning is the bright orange hands I ended up with for 3 days. I looked like I smoked 300 fags a day. Caution is advised – you have been warned. For the best results put all the paste ingredients into a pestle & mortar and pound for 10 minutes into a fine pulp. Or blend in a food processor with 2 tablespoons water into a smooth paste. Heat the oil in a wok or large pan over a moderate heat. Gently fry the onions, garlic and ginger for 4-5 minutes until softened. Add the curry paste and stir for 1 minute. Add the chicken and stir for 5 minutes until lightly browned on all sides. Add the salt, coconut milk, fish sauce, sugar, red chillies and 100ml water then stir and bring to a simmer. Reduce the heat and simmer gently for 30 minutes stirring occasionally until the chicken is cooked through. Remove from the heat and stir in the lime juice just before serving. Serve on rice or rice noodles with a sprinkling of coriander and fresh red chillies.